Adrianne Kalfopoulou has had her work appear in print and online journals including Hotel Amerika, World Literature Today, ROOM magazine, The Broome Street Review, Web Del Sol, VPR (Valparaiso Poetry Review) and Fogged Clarity. 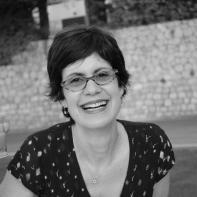 She lives and teaches in Athens Greece, and is on the faculty of the creative writing program at NYU. Her most recent book publication is Passion Maps (Red Hen Press), a poetry collection. Violent seas have swept me elsewhere. I've decided I don't like Skype. The appearance of a friend or loved one, my daughter for example, in a time zone and country so many geographies away, when I am here — or wherever I am — disorients me; how to express this “here” to her “there” or understand her “there” in my “here”? Here, at the moment, is Athens in collapse. Walking through clusters of Pakistani and African immigrants, I am careful not to step on the spread sheets of imitation designer bags, sunglasses, and clothing for sale. Traces of tear gas still in the air from the latest protest skirmish, makes my skin sting as I find myself suddenly coughing. Here, we are increasingly short-tempered, and aggressive, a result of the ongoing “austerity measures” that are producing strikes, unending garbage pile-up and transportation challenges when the metros and buses decide to join in the work stoppages. Over Skype I am describing to my daughter in New York how the garbage has taken over the city, how the overflow of now-stinking heaps next to schools and hospitals are creating a hygiene problem. My daughter is suddenly in a hurry to get to her morning class. I nod, taking in the quick glimpses of her Brooklyn apartment where I stay when I'm there. From this divide of time, it is early morning for her, and mid- afternoon for me, her world very far from what is happening here. Yet before she hangs up she says the Occupy Wall Street movement is gaining momentum there, that she and others from the school go to Zuccotti Park whenever they can. So it surprises me that she is acting estranged by my descriptions of things in Athens. It was only a few months ago that she was here. When the first troika loan package was voted on by the parliament in June 2011, she had insisted on being in Syntagma square during the demonstrations. Terrified at the indiscriminate tear gas and the chance of a tossed piece of marble hitting her, I begged her to leave. The anarchists were chipping off slabs from steps and banisters and hurling them at the police. “We're together” she'd said over the cell phone. “We're taking care of each other.” I left work to walk to the square in the midst of the protesting; masked hoodlums were screaming to each other as they ran to catch up with, or run from, the police while people kept wading through the chaos. Here, I see what I see of what she is describing of the Occupy movement through the web. I see the demonstrations; reports on the gatherings at Zuccotti Park. I tell my daughter never to resist if a policeman approaches her. She says “I know, I know” but her tone unsettles me. There is no possibility for me to cross the streets to Zuccotti Park the way I did when she was in Syntagma, though Skype seduces me. I can believe she is a lot closer than she is when I see her in her brick-walled kitchen, forget that it is past midnight there, her day long over as mine begins. It is the eighth day of the garbage strike and one morning I see the addition of a bed frame, fluorescent ceiling bulbs, and a dresser without drawers added to the trash heap outside my apartment. Why is anyone putting these things out during a garbage strike? Old furniture could be left on a balcony; almost all apartments in the city have one, even the smallest. Then there are the paliagis, gypsies who drive by in their battered trucks calling out on microphones for used appliances and furniture. So why add more junk to the overburdened trash? There are more oddities in the garbage near my work place, this time it is curtains, a box of assorted shoes and gloves. Is this part of a desire to clear out private junk when public chaos threatens to become a contagion, a denial too that our private living spaces cannot stay forever separate from these encroachments? As the strike drags on I start to notice an acrid scent wafting up from the street. There's a late October chill so I don't open the windows as often. Then one morning from my kitchen I see something brightly orange at the corner street of the apartment building, and realize it's a garbage bag on the verge of toppling from the trash heap into our neatly trimmed garden. When Hannah Arendt discusses the differences between “the public realm” and “the private realm,” she points out that in Greek antiquity the two remained distinct spaces. The public realm, a space for political action, was made so by values preserved and nurtured in the privacy of such spaces as the household: “If there was any relationship between these two spheres, it was a matter of course that the mastering of the necessities of life in the household was the condition for freedom in the polis” (my emphasis). Are those strange household additions in the garbage a skewed effort to master, as Arendt might put it, a domestic world trying to stay the contagion? There's the “Greek contagion," “the Greek Crisis as contagion” the threat of an economic contamination to healthier European economies. “We want to make sure the Greek problem does not infect the economies of other countries” one German economist points out. It is a word constantly in the news these days. The garbage too is a contagion outgrowing public trash bins, now a danger to whole neighborhoods. Municipalities are sending people out with thick orange bags to keep the loosened mounds contained. And yet, they are spilling over into gardens and school yards. I find myself stepping over blackened orange rinds; a now transformed shape of what I gather must have been a hairbrush. “What?” I am half laughing as I tell her I thought I was hallucinating when I heard her from the kitchen. “They would have to be someone I've accepted on Skype.” I say, though she's not convinced anyone couldn't hack the account. She's in the Bobst library studying. I can see the weather in New York is cold; she's wearing a wool cap and a turtleneck, telling me she was at an OWS gathering earlier, helping with the cooking. “Be careful,” I say, which annoys her. It seems to be the first thing I say every time we talk. I add, “I'm still the mother listening to the girl calling me from the garden.” She smiles and asks how things are in Athens. “Crazy,” I say, “the strikes I mean.” I mention a port authority work stoppage which wouldn't allow passengers off their cruise ships. “So they left and took their tourism to Turkey.” A similar situation with the air traffic controllers ended when the government forced them back to work. “Things need to get worse” she says, “Otherwise nothing will change." I find myself trying to be patient: our converging worlds contest each other. Which reality will impose itself over the other? Will the sheer volume of trash overwhelm, infect the embattled? I too am warning her of contagion, bodies of police enforcement trying to contain the spontaneity of people's movements. I see images of uniformed NYPD officers pushing, sometimes battering, those who will not move out of the way when they block public spaces like the Brooklyn Bridge; there was the recent incident when police shot pepper spray into the faces of students during their sit-in at the University of California in Davis. She tells me she is disappointed in the reaction of some of the faculty at her school when students caused some damage to an area they were occupying. “What kind of damage?” I am thinking of the broken marble from bludgeoned fountains and steps to the spray-painted statues and walls that have transformed the center of Athens. “Some of the walls had graffiti on them” she says. A group of professors wrote that the damage was going to cost a handful of student assistantships. There was a rebuttal by political science faculty who noted that seizing space to speak for the public at large did not always express or respect the behavior of those who govern. Another convergence; the chasm between those who dominate and those attempting to lay claim to spaces that have marginalized them; it happened in London's Trafalgar Square with protestors chanting “Whose streets? Our Streets.” At the UC Davis campus where students forced police to retreat with their chanting “You can go!” As Nathan Schneider put it in his 1/2012 Harper's “Some Assembly Required," “An occupation by definition, has to start with people physically present.” And that presence is there to contest, displace or replace another body. Michael Kimmelman's article on the Zuccotti park encampments, made a similar point: “characters representing disparate political and economic disenchantments” nevertheless find “their grievances overlap on literally common ground.” The OWS assemblies were like swarming antibodies. They were not the infection; they were making it visible. What is the principle behind occupation? To physically contest a pre-existing reality—overwhelm it, the way the garbage strikers in Athens hope the trash will spread, and force politicians and ministers “to do something” about the austerity measures. But no matter how bad the strike gets and how much garbage piles up and spills over, Herodus Atticus, the street in Athens that used to house the royal family when there was a royal family, is always clean. Its atypically wide pavements attract tourists who take pictures of the stoic Evzones in front of the residence of the country's president, and represents how the 1% lives, how this tiny, very powerful percentage guards their manicured gardens and swept pavements, no matter what trash accumulates just meters away; or a country away. The Euro zone's more affluent members have become concerned that Greece's junk bonds will contaminate their economies. Words like “firewall” express fears that more privileged systems are in danger of being overrun by the Greek debt. Yet the Greek debt is multivalent. Germany and France have benefited from the economic dependence of the Euro zone's less privileged members. The garbage surrounding the healthier economies has, among other things, also been the result of these economies' dumping of some trashy exports into the economies of the poorer member states. There is the story of the faulty German submarines sold to Greece which kept capsizing; the outstanding Siemens scandal which Greece's Nea Democratia government negotiated. Siemens installed most of the infrastructure for the 2004 Olympics, a large scale financial windfall for the German company in which highly placed government officials and businessmen were implicated in questionable bonuses. To date no one has gone to jail despite court injunctions (one businessman fled to Germany), while the German-bought submarines have been retired to some submarine graveyard. One steps carefully when occupying space overlaid with occupations—it's easy to slip on the rotting slime, the spilled refuse, broken glass. I am thinking of the ancients when she clarifies that she is referring to the country's modern moment. Though Syntagma square is not the Agora, she insists it was a prelude to the OWS movement, when the “Indignants” last summer turned the square into a tent city. Kimmelman quotes Aristotle's “Politics” in his Zuccotti park piece, and notes the size of the ancient polis as a basis for its achievement of consensus; the extent to which “a herald's cry” might be heard is linked to social order. The physical presence of voices heard, like the “mic check” refrain that circulates the speaker's words in the assemblies, forces people to concentrate, to listen; the human point of reference is a connecting body occupying the moment at hand. “Mom,” my daughter writes to me, “I've been looking for you over Skype.” I write back that I have been away from the computer lately, preoccupied with what's been happening here. She answers, “When I'm at home I don't like it either.” I tell her I am spending time with friends, sometimes help out at a shelter. We seem to need to be around one another, to keep talking about what has happened to us and the city in these two very dramatic years since the government announced the debt. During a panel of British and Greek writers addressing the debt crisis in Europe, Alex Preston, a young British novelist who used to work in banking described the profession as filled with people without any loyalties to nation or belonging apart from the pure, abstract power of money, people who spend their lives “pouring over a barrage of data in a virtual world” that forfeits “the tangible, skin-covered reality of people like teachers and nurses who pay taxes.” Preston's chilling description of “these hideous people picking their teeth over numbers” who exchange the real time tragedies of nations for the abstractions of market potentials, seemed an apt image of the suited bankers flying into and out of Athens, bartering with technocrats and ministers over the country's debt and lost economic sovereignty, their plush hotels and offices, like the residences on Herodos Atticus, far removed from the accumulating garbage rotting on Athens' streets. I say, “Here everything feels splintered. There are the anarchists, the immigrants, the Nea Democratia and PASOK groups. Even the IMF, ECB and EU can't agree on a strategy, unless it's to find a way to get the most out of a situation that's getting worse.” I describe the homeless on the streets. “Not just the people in rags,” I say, “at least not yet” and tell her of a man of around forty who looked like he could have been sitting in a café with his clean, tanned jacket. He turned up at the shelter looking for his mother. She refused to tell her son where she stayed after she was forced out of the place she rented. He knew that she went to the shelter for food. He was also living with a friend after he had lost his job a year ago. “Yes," I say, very quietly. We are on the phone and I am glad she can't see me. Some friends in Athens are refusing to turn on their televisions—to keep themselves unaffected by what one describes as “the news cesspool.” “If Greece is going to collapse it will collapse with or without me,” Katerina says. It is the human point of reference which feels most threatened, what remains most vital. One Greek news commentator keeps repeating, “We are being occupied by foreigners again,” the idea of occupation, for Greeks of a certain generation, is still resonant with the Nazi Occupation. Of course, as Mark Mazower points out in the unfortunately titled “Greeks vs Germans” that appeared in a December 2011 issue of the New Statesman, “The absence of armies in the entire unfolding Euro-saga is so obvious to us that we ignore its historical meaning.” But as Greece's modern moment converges with historical memory, as people grow impoverished, made ill by the bleakness of the news and their realities, it is getting harder to listen for the eloquent line, to pick out the carefully voiced fact, to differentiate what we can still recognize in the garbage—a hairbrush, a box of shoes, a rat. Arendt, Hannah. The Human Condition. 1958; Chicago, Ohio: University of Chicago Press, 1998. Kimmelman, Michael. “A sense of place empowers protests.” International Herald Tribune, The Global Edition of the New York Times, October 17, 2011. Mazower, Mark.“Germans vs Greek.” New Statesman, December 6, 2011. Ratushinskaya, Irina. Beyond the Limit. Trans. Frances Padorr Brent and Carol J. Avins. Northwestern UP, 1987.